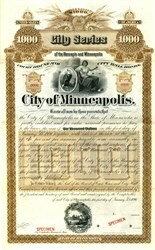 Beautifully engraved Specimen $1000 Court House and City Hall Bond certificate from the City of Minneapolis printed in 1890. This historic document was printed by the American Banknote Company and has an ornate border around it with a vignette of Lady Justice and the original Great Seal of the State of Minnesota. This item is over 128 years old. Coupons attached on right side. Minneapolis is the county seat of Hennepin County, and the larger of the Twin Cities, the 16th-largest metropolitan area in the United States. As of 2016, Minneapolis is the largest city in the state of Minnesota and 46th-largest in the United States, with an estimated population of 413,651.The Twin Cities metropolitan area consists of Minneapolis, its neighbor Saint Paul, and suburbs which altogether contain about 3.5 million people, and is the second-largest economic center in the Midwest.